Shortly after Joe passed, I upgraded from film to a digital camera (Cannon Rebel). Photography was one of my hobbies before Joe and I became a couple and I quickly returned to it after he passed. It was a casual hobby the first year but once I got laid off, at the start of the 2nd year, I was back into photography full force. Photography brings me such peace and joy. Most of the time, I have either the point and shoot or the Cannon by my side. I had the point and shoot at work with me when I looked out my window and saw my credit union members munching on leafy greens, smooching and singing. So I grabbed the camera and started shooting Scarlet, Rhett, Ashley and Al (as in Pacino). Scarlet & Rhett – Together At Last. “Say hello to my little friend.” I call him Al. Sorry if you actually thought I was going to violate privacy laws and reveal all the nitty-gritty details of what goes on at work. Thank you God for blessing me with a job where I have a spectacular view – all created by you. Well, I do not know why Mom called this “Rommie & Michele’s Backyard Safari Adventure” as I was asleep in the foyer when this happened. Shame on Mom for not waking me so I could greet my guests. Mom said she took most of these pictures through the sliding glass door as she was afraid opening it would scare them off. She did manage to quietly slide it open and snap a few picture. Mom and I are so blessed because not everyone has a scenic view like we do. So I hope you enjoy Mom’s snapshots. Love, Hugs and Sloppy Wet Kisses to all! Deer # 3 looking for the other two. All 3 looking at camera ( you can only see the eye of one deer by the tall green leaves. Since more snow is falling this Saturday morning. I decided to do a poem and pictures for Weekend Wisdom. Enjoy! Tuesday and Wednesday saw an increase in traffic to both this site and the sister site OgleOhio.com. As a result, the likes and subscriptions increased. So I decided to do a post thanking my long-time readers and my new readers for subscribing to my blog, after all this is still June and I am still participating in Lisa Ryan’s “5 Thank You’s A Day 30 Day Challenge. I am going to say thank you the best way I know how – with flowers. 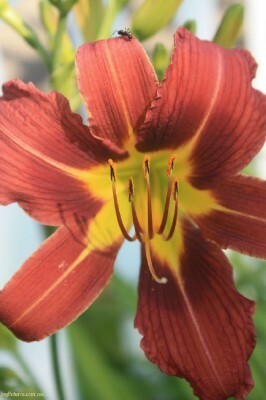 So this day lily, picked (with my camera) fresh from my front yard, is for you. There are 7 stamens, you just are unable to see the 7th as it is hidden. Whether you are new to this site, or a long-time reader, thanks for your support. Stay tuned as a new weekly series premiers on Monday 6/25 – Rommie & Michele’s Backyard Safari Adventures. For those of you new here, Rommie is my golden retriever. We have a sizable yard to care for and have some wild adventures in keeping it maintained. Today is Day 1 of Lisa Ryan’s 5 Thank You’s 30 Day Challenge. Thank you Lisa for this challenge. So what better way to start off the challenge than with a Slideshow?! Today’s Slideshow is a thank you to God for everything He has created. It seemed the best way to kick off this challenge. After all He is indeed great – and always will be. “This One’s For You” God. THANK YOU! Well, I had this slideshow beautifully set to music but even after I saved it, Slideshare undid my work.